Government will declare the DA(Dearness Allowance) to the State Govt Employees According to the central DA. Central DA will be decided as per the points raise in All India Consumer Price Index values. After declaring the DA by the Central Government, State Governments will announce DA to their State Government Employees accordingly. Telangana Govt issued DA GO MS No 55 enhancing Dearness Allowances to Teachers and Employees in Telangana From 24.104% to 25.676% with effect from 1st July 2017. However, in the case of employees who are due to retire on or before 31st of October, 2018, the arrears of Dearness Allowance shall be drawn and paid in cash as the employees due to retire on superannuation are exempted from making any subscription to the General Provident Fund during the last four months of service. In respect of the employees who were appointed to Government service on or after 01.09.2004 and are governed by the Contributory Pension Scheme (CPS), 10% of the Dearness Allowance arrears may be claimed in the Month of July, 2018 and shall be credited to the PRAN accounts of the individuals along with the Government share as per the existing orders. The remaining 90% of Dearness allowance arrears shall be paid in cash, with the salary for the Month of June, 2018, payable on 1st July, 2018. Each employee desires to know the Amount of DA which will be paid to them as DA Arrears by the State Government. 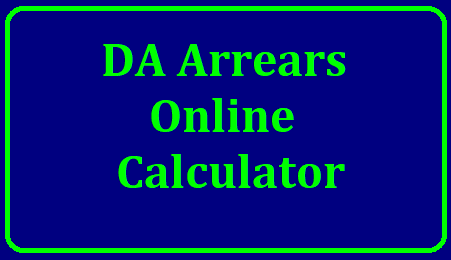 To know the exact DA Arreas we created a online software which can show you the DA Arrears of the individual employee as per their Basic Pay. Select Basic Pay as on 01-07-2017. Select Increment month if increment falls during the period form 01-07-2018 to 30-04-2018.
if increment doent falls during the period then select "Not Availed". Enter the details below & get your DA Arrears of each month in detail.